The Sarafine is a luxury design on a hillside walkout. Arches and a cupola highlight the exterior, along with a metal accent roof. The kitchen island, with cooktop, faces the great room and the dining room offers a serving bar and a nearby walk-in pantry. A sitting room accompanies the elegant master suite. The oversized utility room enjoys a laundry sink, built-in cabinetry and access to the side porch. 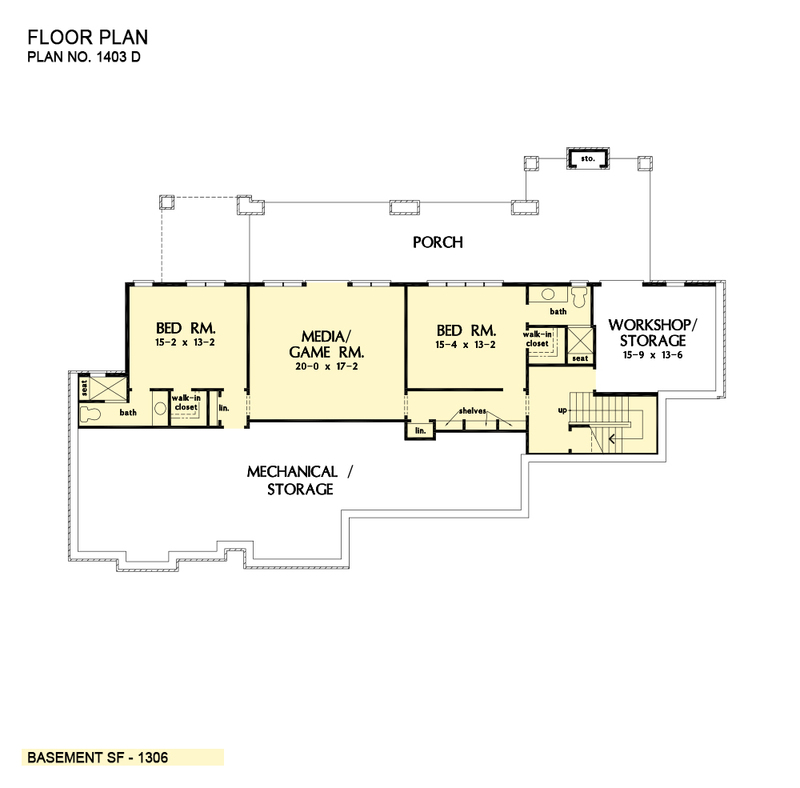 Downstairs, find two bedrooms, a media/game room, and a workshop. 1st Floor: 2516 Sq. Ft.
Porch - Front: 154 Sq. Ft.
Porch - Rear: 351 Sq. Ft.
Porch - Screened: 258 Sq. Ft.
Porch - Rear Lower: 630 Sq. Ft.
Porch - Right: 54 Sq. Ft. 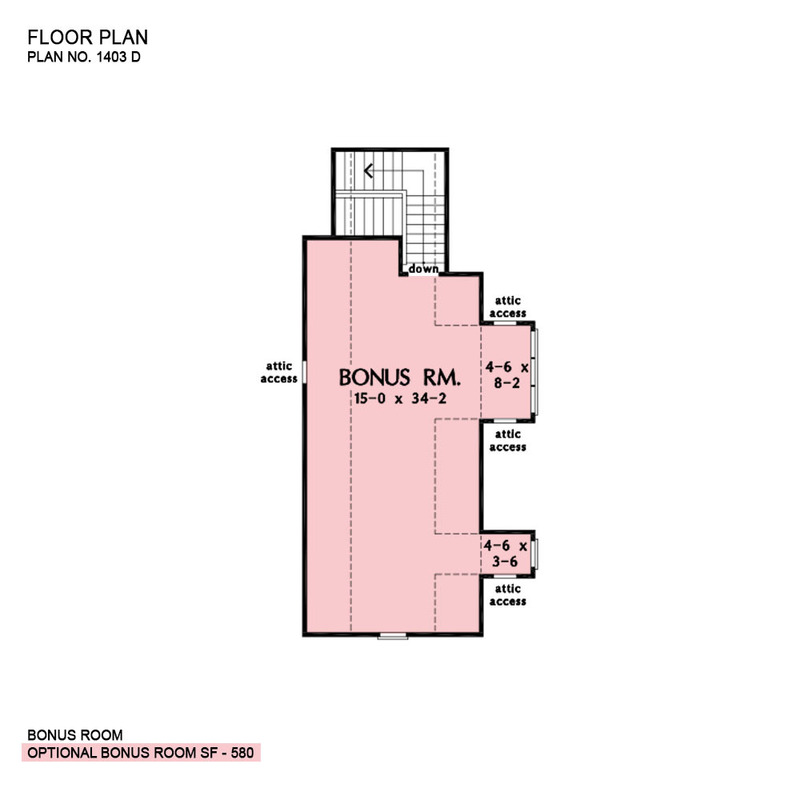 Bonus Room: 580 Sq. 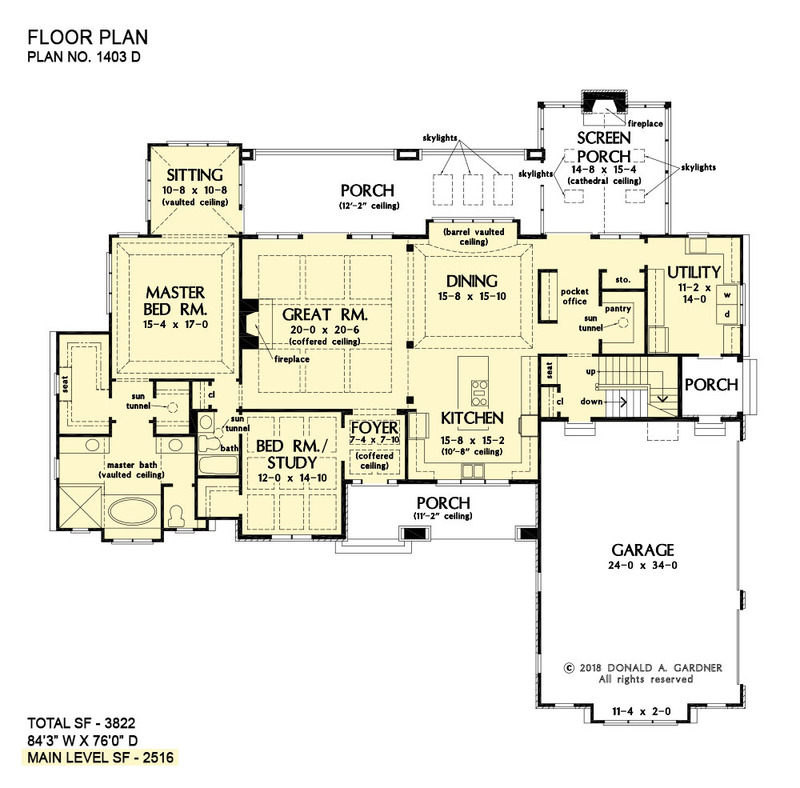 Ft.
House Dimensions: 84' 3" x 76' 0"
Great Room: 20' 0" x 20' 6"
Master Bedroom: 15' 4" x 17' 0"
Foyer (Coffered): 7' 4" x 7' 10" x 12' 0"
Dining Room (Tray): 15' 8" x 15' 10" x 12' 0"
Great Room (Coffered): 20' 0" x 20' 6" x 13' 6"
Kitchen (Flat): 15' 8" x 15' 2" x 10' 8"
Utility Room (Flat): 11' 2" x 14' 0" x 10' 0"
Bonus Room (Clipped): 15' 0" x 34' 2" x 9' 0"
Garage (Flat): 24' 0" x 34' 0" x 0' 0"
Garage Storage Bay (Flat): 11' 4" x 2' 0" x 0' 0"
Master Bedroom (Tray): 15' 4" x 17' 0" x 11' 6"
Bedroom / Study (Coffered): 12' 0" x 14' 10" x 12' 0"
Bedroom #3 (Flat): 15' 4" x 13' 2" x 9' 5"
Bedroom #4 (Flat): 15' 2" x 13' 2" x 9' 5"
Porch - Front (Flat): 23' 2" x 6' 8" x 11' 2"
Porch - Rear (Flat): 36' 0" x 10' 4" x 12' 2"
Porch - Right (Flat): 7' 4" x 7' 4" x 10' 0"
Porch - Screen (Cathedral): 14' 8" x 15' 4" x 18' 11"
Media Room (Flat): 20' 0" x 17' 2" x 9' 5"
Sitting Area (Vaulted): 10' 8" x 10' 8" x 18' 1"
Pocket Office (Flat): 7' 0" x 5' 10" x 10' 8"
Storage (1st Fl.) (Flat): 5' 2" x 2' 0" x 10' 0"
Storage (Other) (Flat): 15' 9" x 13' 6" x 9' 5"
Other (Flat): 4' 4" x 1' 8" x 9' 5"
Porch - Rear Lower (Flat): 51' 8" x 10' 4" x 9' 5"